"Colm Mulcahy is a professor of mathematics at Spelman College, in Atlanta. Over the last decade, he has been at the forefront of publishing new 'mathemagical' principles and effects for cards, particularly in his long-running bi-monthly Card Colm for the Mathematical Association of America (MAA). He also blogs at the Aperiodical and the Huffington Post. Dr. Mulcahy has been a recipient of the MAA’s Allendoerfer Award for excellence in expository writing. His interests are broad, ranging from algebra and number theory to geometry. He earned a B.Sc. and M.Sc. in mathematical science from University College Dublin and a PhD from Cornell University for research in the algebraic theory of quadratic forms." 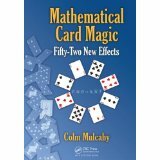 author of "Mathematical Card Magic: Fifty-Two New Effects"
1. You're both a magician and a mathematician… which interest came first, and have the two interests intertwined most of your life? Also, at what point did you know you wished to pursue math professionally? I came to magic very late in life, in my early 40s. Hence, combining that with my natural laziness, I’m a terrible magician. Had I started at 14 like the rest of them, today I’d be good at double lifts, false counts, Charlier passes and the like. So I have to resort to---gasp!--- mathematics, to entertain with a deck of cards. What I do (and what’s in my book) is largely original creations. Forget clichés like dealing into three piles, basic addition or subtraction disguised, or casting out nines. Those are hackeyed and pretty boring in my view! As it happens, the only sleight-of-hand I can do is a perfect faro shuffle. That took me a month to learn to get it right, after an intensive one-on-one tutorial from the ever-patient Mark Setteducati a decade back. The only reason I stuck at that was because the mathematical possibilities fascinated me. But what really fascinates me are the possibilities with a genuinely shuffled deck, or a slightly rigged deck, even after a riffle shuffle done by a spectator. That’s what I’ve come to specialize in. And none of my creations take advantage of perfect faro shuffles; that would put too much pressure on myself. Of course I take a dim view of crimps or other card marking. I will include a little false shuffling, or tell a few white lies such as “I couldn’t possibly know what these cards are” for entertainment purposes, but the underlying principle of the magic I do has to be mathematical. As regards my real career---the day job!--- when I started university as a teenager, I didn’t know that it was possible to focus just on mathematics, which was the only subject that made total sense to me then. I had assumed I’d end up in science, like my brother before me, probably physics in my case. But after six months I discovered that I could soon drop all yucky labs and do nothing but pure and applied mathematics coursework—what a revelation! (This was in Ireland, where it was assumed that you already had picked up a decent liberal arts education in secondary school.) I went for it, hook, line and sinker, and never looked back. I believe I’m still a student at heart, and a life-long learner. The only real job I’ve ever had was the three years I served as department chair. For the past few decades I’ve actually been getting paid to study---I hope nobody finds out---and also to share the fun with others, they call that teaching, writing, publishing and presenting. 2. You're originally from Ireland… can you say what brought you to the States to begin with and do you get back to Ireland often? I came over after doing my masters, back then it was impossible to get funded to do a PhD in Ireland. I've been lucky to be able to get back often over the decades, at least twice a year these days. Maths Week Ireland (www.mathsweek.ie) sometimes have me over, it's the largest mathematics outreach programme in the world (http://www.huffingtonpost.com/colm-mulcahy/math-weak-try-math-week_b_2008517.html), with over 130,000 kids getting involved last year. I spoke to 1000 of them myself, up and down the length of the country, in the course of my gruelling but fun 9 day "fall break". The Maths in the Street activities are a hoot, because you get to engage curious people aged 8 to 80, who just go out to do their shopping and they get home with groceries AND a knowledge of the Towers of Hanoi, how to solve a maze, or a card trick they can do for the family. 3. You were a friend of Martin Gardner through the last decade of his life… are there any behind-the-scenes stories about Martin you can share that might interest my readers? Martin was amazing. Humble, incredibly focussed and hardworking and productive. So kind, and generous with his time and wisdom. We chatted on the phone and corresponded on and off from 2000 to 2006, when I finally visited him for the first time. By then he was in his 90s, and probably not as sharp as he’d been a decade or two earlier. He was certainly a little forgetful: sometimes he didn’t remember that he’d already mastered something and written about it, but he could look it up quickly in his amazingly organized files, and it would come back to him right away. And his less robust state didn’t stop him writing a half dozen books in his last five years, including the ace up his sleeve, his autobiography. Back in 2000, I’d sent him about 50 Latexed pages of notes I’d made on mathematical card tricks---Latex is what most mathematicians use to typeset their work---largely stolen from assorted publications of his. He responded with enthusiasm, and suggested I write a book on the topic. I was flattered of course, but knew I’d have to come up with a lot more original material for that to be a reasonable proposition. I set myself a personal goal of getting it published by 2006, the 50th anniversary of his landmark "Mathematics, Magic and Mystery," and found a willing (university) publisher. I’m deadline driven: without one, a lot of things don’t get done. With a deadline, they eventually get finished, although seven years late in this case, and with another publisher. Along the way I decided to try to switch to the premier outlet for recreational mathematics, AK Peters (now part of CRC Press). I was very happy that Klaus Peters offered me a contract and that I finally delivered the goods this year, before books become obsolete. 4. Gardner was surprisingly unpredictable in some of his viewpoints and interests… in your time with him was there any particular view he held or interest he had that most surprised you, or that the two of you debated over? He tried to engage me in a debate once about whether I thought mathematics was discovered or invented, which is of course an old conundrum, and one he had definite views on. Being the shallow person I am, I refused to be drawn in. It never really interested me, though of course it should have. In more recent years, I have asked myself the same question in relation to mathemagical principles which I have stumbled on. Did I create them out of nothing, or did I just get lucky and find them because I was kicking around in the leaves where nobody else before me had? I still don’t know. I probably should have paid more attention to Martin on this topic. Following his death, many tributes assumed, as I myself had in earlier years, that he was either agnostic or atheist. Not so. I wouldn’t presume to speak on his behalf---we never discussed it and his views here are well documented in his own writings---but I believe he was a theist who did not believe in any organized religion. That surprised me when I first realized it. One sweltering March day when I was visiting him, I spotted a curious object hanging up over the sliding door to the outside, and I asked him what it was. It was a small musical saw. He confessed to playing it on rare occasion for relaxation. Despite my gentle encouragement he made it clear that there would be no public or private performance, and I felt a little embarrassed, as if I had intruded on his privacy. I never wanted to bother him unless I had something to share which I thought he’d really appreciate knowing about, but I did have a habit of phoning him now and then while waiting to board flights. The very last time I did this—about six months before his death---I ended the call as I often did by asking if he’d had any interesting visitors, and he replied in the negative, as usual. After some prodding he perked up, and said he’d had one surprising visitor, which baffled him: Richard Dawkins. He added something like, “I don’t know why somebody famous like that came to see me.” I retorted, “Because YOU’re famous!” but he wasn’t having any of that. I went on, pointing out that Dawkins had written much about theology and philosophy, just like he had. He revealed that all they’d done was chat about life, and grandkids and baseball---Dawkins had just given a talk at the university nearby---until his visitor stood up to leave because he had a plane to catch. Then they both realized that there was a big topic they were supposed to discuss, and they sat down again and chatted intensely for 15 or 20 more minutes. At this point I had a plane to catch myself---I was about to fly from Boston to Dublin---and I never got to hear the rest of the story. Or, sadly, Martin’s voice again. I'd grown very fond of him. Such a sweet unassuming man, for such an intellectual giant. [-- Wow, fascinating Dawkins story… easy to speculate that they could've had an 'intense' chat over the nature of religion or religious belief, but purely a guess; no doubt many possibilities. If any readers, perchance, know Dawkins well enough to ask him about it, I'd LOVE to hear what the "the rest of the story" is! 5. What are your own favorite aspects of mathematics to study or read about, and if you could only take say 3 or 4 math books with you to a desert island what might they be? I like surprises and counter-intuitive things which every graduate in all disciplines should know, such as not-so-obvious averages (http://www.huffingtonpost.com/colm-mulcahy/mean-questions-with-harmonious-answers_b_2469351.html) and non-Euclidean geometry. Most of us are smart enough to know that the earth isn’t flat, but is space flat?? I especially like things that teach us to distrust simple “numerical evidence”: The false positive paradox. Simpson’s paradox. The Birthday Paradox. Benford’s Law. The Gilbreath Principle. There are probably five more of them out there that we all need to know about. If anyone knows what they are, please tell me. I’m woefully ignorant of topology, but if Pontryagin and Morin (both blind) could contribute so much to the subject, it wouldn’t kill me to learn a little. I never really got quantum mechanics as a student all those years ago, it was the one topic I faked understanding, perhaps taking false comfort from the fact that Einstein didn’t buy it either. I’m not that attracted to it, but if it was an undergraduate topic in the 70s, I should be able to handle it. It’s time I understood the whole mathematics/music connection. It might help if I actually knew something about music, but I’m strictly an avid consumer. Of course we should all study Diaconis and Graham’s "Magical Mathematics" daily. If I could master half of the tricks in it, I’d die happy. 6. Do you have one mathematical-related achievement from your life that you're most proud of above others? I suppose getting my first book out, twenty-five years after I first considered writing one, and after starting and abandoning two others! The one just published bears no resemblance to anything I would have considered writing even fifteen years ago, and the people who trained me probably wouldn't recognize it as having much to do with mathematics, but it contains a lot of fresh creations. I hope it turns some youngsters on to the joys and possibilities of mathematics. Starting in 2012, I've been blogging for the "general public", and not just for card magic aficionados as I do in Card Colm at maa.org. I've written some things for the Huffington Post http://www.huffingtonpost.com/colm-mulcahy/ and also for The Aperiodical in the UK. http://aperiodical.com/category/columns/maths-colm In recent times, both have taken a back seat due to the focus I needed to bring to getting my 380-page book manuscript to the printers, set up appearances and book signings and so on, but I plan to get back to that kind of blogging soon. There's a big world out there that needs to have a better attitude about mathematics. We've never had the best PR, and I aim to play a role in improving the image of the subject. I've always had a big issue with the claim that people are either numbers or words people. Many of us are both. Some mathematics teachers are reluctant to correct basic spelling and grammar in their students' work, for instance, either on the basis that it's not their job, or it doesn't matter. Wrong! It's all about communication, about being able to justify your position with a cogent argument using words AND numbers correctly. A string of numbers presented without accompanying text is hardly convincing, and may in fact mask the presenter's confusion or ignorance. We all need to have a healthy skepticism of numbers and "experts" and learn to make informed decisions ourselves. And be willing to change our minds in the light of compelling fresh evidence. Ironically, education is no inoculation against frauds and charlatans, whether they're peddling hokey stats or snake oil. James Randi can confirm! 7. When you're not reading math or magic, what other types of reading do you like? And what other hobbies or activities do you enjoy? Irish fiction. World history. Cookery books. Music, music, music. I cook a lot and indulge in craft beers and chocolate more than is good for me. I jog and am trying to bike more often, to atone for my sins. Actually, I’ve always found that such outdoors exercise stimulates the mind. Over the past ten years or so, some of my best ideas for new Card Colms have come to me while puffing and panting. I am not alone in that regard (see http://www.huffingtonpost.com/colm-mulcahy/sports-and-mathematics_b_2475226.html ). 8. And back to Martin… You've been heavily involved with the "Gathering For Gardner" and "Celebration of Mind" (coming up soon in October) events which honor Martin Gardner's legacy. Most Gardner fans are probably familiar with these events, but can you give a quick synopsis of them for anyone unfamiliar? And do you have a particularly memorable experience from one of these events that stands out for you over the years? G4G is an insider and by-invitation-only conference held in Atlanta in March of even-numbered years. They’ve being going on for 20 years. They attract very creative and interdisciplinary mathematicians, puzzlers and magicians as well as skeptics, illusionists, Alice afficionados, and so on. Four or five days of extreme intellectual stimulation and networking. You might meet some of your heroes, from Randi to Shortz, Conway to Penrose, Teller to Smullyan. A few years back there, Erik Demaine announced that any two polygonal regions of the same area are hinge-dissection equivalent, meaning that the first can be cut into pieces and these swung around on hinges to form the second. He got a standing ovation. I was present when history was announced. It was awesome. I was able to tell my students at Spelman soon thereafter when I proved for them the much easier version ignoring hinges. Who’d have thought it, a new math result proved in their college days that they could at least understand the statement of? The 'Celebration of Mind' events were started in 2010, a few months after Martin died. These are open to all, anywhere on the planet. Anyone can host one or attend one---a few are strictly private but that’s not common. They’ve happened on all continents and at both poles. They take place in and around October 21, which was Martin’s birthday. We’d like this to go viral as well as global, especially with Martin’s centennial approaching in 2014. There should be thousands of them each year, celebrating the triumphs of the human mind with cool stuff Martin made us think about: recreational mathematics, brain teasers, logical loopholes, rationality, skepticism, optical illusions, puzzles mechanical and cerebral, the mathematics of M.C. Escher and Mandelbrot, origami, the list goes on. The www.celebrationofmind.org webpage has terrific resources, check out Vi Hart’s series of four hexaflexagon videos from last year to get some ideas of the fun and depth which lies just below the surface of innocent-sounding explorations. Please also follow @WWMGT on Twitter! There’s another celebration I’d like your readers to know about: the theme of the next Mathematics Awareness Month in the USA is “Mathematics, Magic and Mystery,” named after Martin’s groundbreaking book from 1956. So in April 2014, American school children and students of all ages will be exposed to some cool stuff reflecting the amazing mathematical legacy Martin left behind. 9. Any parting words, not covered above, you'd want to pass along to a math-oriented audience? Life can be short---just ask Steve Sigur or Kirsty MacColl---and it’s certainly finite. Follow your dreams while doing something worthwhile. Share your toys. Cherish your family and friends. And as Nick Lowe said four decades ago, what’s so funny about peace, love and understanding? Oh, you said a math-oriented audience… same advice, plus or minus epsilon. Please do check out Colm's Webpages and book.